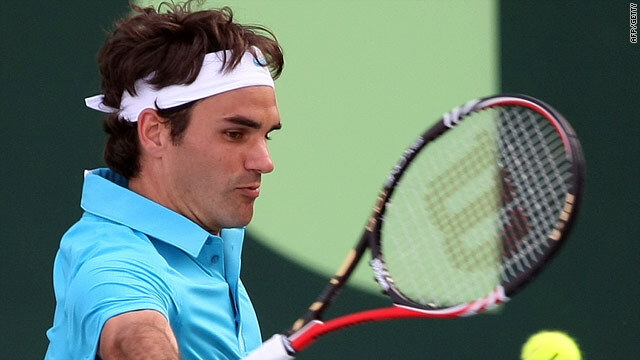 Federer could not cope with the power hitting of Swede Soderling in Abu Dhabi. (CNN) -- Roger Federer made a losing start to his 2010 campaign as he was beaten in three sets by Swede Robin Soderling at a high-profile exhibition tournament in Abu Dhabi on New Year's Day. The world number one claimed the first set on a tight tiebreaker and was a break up in the second before Soderling mounted a stirring comeback to win 6-7 7-6 6-2. He will play world number two Rafael Nadal in Saturday's final after the world number two beat fellow Spaniard David Ferrer 7-6 6-3 in the second semifinal. Nadal saved five break points, including two sets points, in the opener before taking control of the tiebreaker. Two breaks of service in the second set put him firmly on course as he showed glimpses of the form which saw him sweep all before him in the opening months of 2009 before knee injuries derailed him. Earlier, Soderling's claimed his first victory over Federer in 13 attempts, losing to the Swiss maestro in the final of last year's French Open after beating Nadal in a fourth round shock. He had a set point in the opener before Federer hit back to claim the next three points to win it 8-6 and claim the early advantage which he built on with an immediate break. But world number eight Soderling retrieved the break in the sixth game and then dominated the subsequent tiebreaker, which he clamed for the loss of a single point. Soderling, perhaps the sharper after beating Stanislav Wawrinka on Thursday to reach the semifinals at the six-man tournament, made no mistake in the decider as he broke Federer in the third game. The top seed had four break points in the next game, but could not break through and lost his service again to slip to defeat. Soderling, who reached the semi-finals of the ATP Tour Finals in London in November, was delighted to have laid his bogey. "I always said the more times I play him, the closer I'll get, and here I am today," he told the crowd. "So far so good, but it's going to be a long season for sure, hopefully I'll get to play against Roger a few more times. "Federer reflected on a tough opening to 2010 season, saying: "Obviously it's hard to start playing against him but I had fun." The players are using the Abu Dhabi event as an early tune-up for the opening grand slam of the year at the Australian Open which starts in Melbourne on January 18. Andy Murray of Britain won last year's tournament, beating Federer and Nadal to claim victory. He is sitting out the event to play in the Hopman Cup which starts in Perth on Saturday while Federer and Nadal head to the ATP tournament in Doha. ATP World Tour Finals champion Nikolay Davydenko is also playing in Qatar after losing to Ferrer in his quarterfinal match in Abu Dhabi on Thursday. But the Doha event lost world number 10 Jo-Wilfried Tsonga, who pulled out with a wrist injury.